Video clip synopsis – In 1938 Jim Taylor lead an epic 15 month exploratory patrol through the Highlands of Papua New Guinea. Broadband MP4 journey_bb.mp4 (14.0MB), suitable for iPods and computer downloads. Journey Back in Time is an excerpt from the film My Father, My Country produced in 1989. In 1938 three Australian patrol officers – Jim Taylor, John Black and Pat Walsh – set off on an epic journey into the highlands of Papua New Guinea. Their purpose: to make contact with 'stone age’ tribes who knew nothing of the outside world and explain to them that their lives were about to undergo incredible change. Fifty years later, Jim’s daughter Meg retraced her father’s steps and met people who remembered the day the patrol arrived. Meg’s observations are combined with excerpts from her father’s journal to provide a personal and poetic narrative about an extraordinary meeting of cultures. A Film Australia National Interest Program in association with the National Geographic Society. The indigenous peoples of the Highlands of what is now Papua New Guinea (PNG) were not known to the outside world until the 1930s. Gold prospectors discovered that the highland terrain thought to be too inhospitable to be inhabited, was in fact teeming with an estimated one million people. Although European explorers visited the island of Guinea in the sixteenth century, it was not colonised until the late 19th century. The large island was divided — the Dutch controlling the west and the Germans and British controlling the east. The southern section of the island (annexed by the Queensland Colony in 1883), became a British protectorate in 1884 and in 1905 was passed to Australia as the ‘Territory of Papua’. German New Guinea was occupied by Australia in World War I and mandated by the League of Nations to Australia in 1920. In 1947, the Territory of New Guinea was placed under Australian rule under the international trusteeship system by the UN (United Nations). Today, the western side of the island, Papua, is a province of Indonesia. Since independence from Australia in 1975, the eastern side of the island is now called the independent nation of Papua New Guinea. What this potted history doesn’t tell us is the human experience of colonisation. Colonisation has had a huge impact on the lives of the Papua New Guineans as well as on the lives of those who colonised. 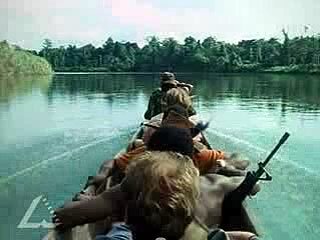 Australian Jim Taylor ventured into the Western Highlands of Papua New Guinea in 1938 as part of a government patrol. The mission was to explore and bring the people of the region under government control. Taylor was mindful that his patrol would have a profound effect on the people of the 'stone age’ tribes who had never before seen white men. Fifty years later his daughter Meg retraces her father’s 15-month journey through some of the world’s most inhospitable terrain. Her father, whom she describes as 'a great man of history,’ died the year before her journey. This video clip introduces Meg’s journey retracing her father’s steps as she reflects on the impact of ‘First Contact’ on the indigenous people. ‘In 1938, Jim Taylor, fellow Australian patrol officers John Black and Pat Walsh and 250 native police and carriers – set off on an epic journey into the unexplored Highlands of Papua New Guinea. Their purpose: to make contact with ‘stone age’ tribes who knew nothing of the outside world and explain to them that their lives were about to undergo incredible change’. In the video clip and the quote above, why are the tribes described as ‘stone age’? Drawing on your knowledge and reflecting on the black and white images in the clip—identify what you think would be important features of the traditional culture of the highlanders before first contact. What ‘incredible change’ were the Highlanders about to undergo? What would be the main reasons for outsiders (‘white men’) traveling to the highlands? Drawing on what you have learned from your study of the Australian experience of colonisation and some independent research – compare the attitudes and motivation of the people who colonised Papua New Guinea with those of the British who colonised Australia. Consider similarities and differences in attitudes to others and their lands and culture. Record your answer in a table or other appropriate format. Jim Taylor and his daughter’s lives have been influenced by the Australian colonial experience in Papua New Guinea. In talking about the journey she is going to undertake retracing her father’s steps Meg Taylor says it is “…part of letting go of great men of history”. Prepare a short speech in which you argue the position, either for or against, of considering Jim Taylor a ‘great man of history’. For interview transcripts, books and references for this Digital Resource go to Pacific Stories, choose My Father, My Country, select INDEX, and go to MORE INFORMATION.